I’m regularly asked if something extra in Walt Disney World is “worth it.” Many of the add-ons don’t hold their value for me. I’ve really enjoyed the Early Morning Magic and the Pirates and Pals Cruise, but haven’t found most of the the extra cost add ons having any value for me. This could be an exception. Read on for an explanation. 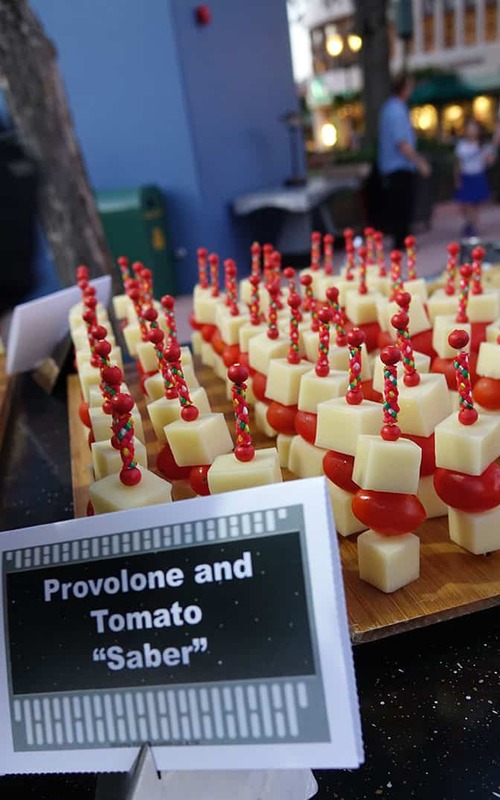 The Fireworks Dessert Party portion will move to the Star Wars Launch Bay on July 10. Party patrons will be ushered to a viewing area about 15 minutes before the Fireworks. I’m not really sure how that will work out, so I’ll need to drop in to see how it differs. In the past, you could find a spot anywhere along Hollywood Boulevard, near Min and Bills or in the Courtyard for a decent view of the fireworks. I always preferred the views that were aligned with the Great Movie Ride like this one. 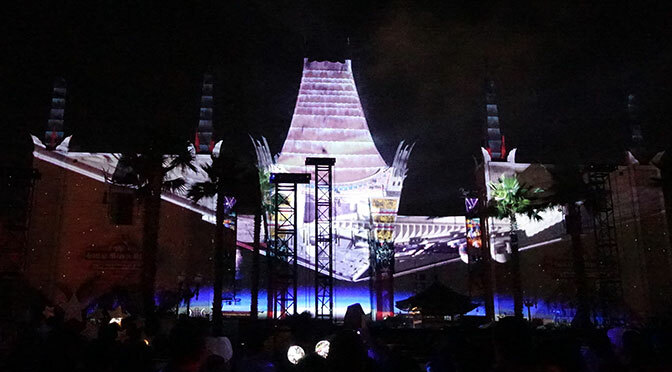 With this new version, Star Wars images are projected upon the Great Movie Ride and the two large tan buildings beside it. To get the best view of the show, you need to be able to see all of this area below AND the large fireworks are now shot off center to the right. You’ll see them where the far right palm tree is located below. It’s because they had to move the pyro location from the backlot area to a newly constructed site. Fireworks also appear from the tan building on the left, the American Idol building and an building even farther to the right out of the frame here. You’re pretty much surrounded by fireworks in some form. In order to have the best view, you should be even with or in front of these large buildings. They were constructed to hold the projection equipment and controls. Here’s a bit of a wide angle of the viewing area. It’s pretty small. 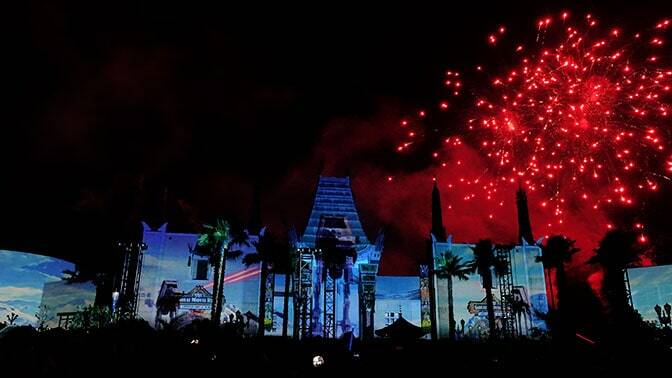 I recommend being aligned with the blue projection building so you’re slightly off center to the left, but can still see the Great Movie Ride and tan buildings I discussed earlier. 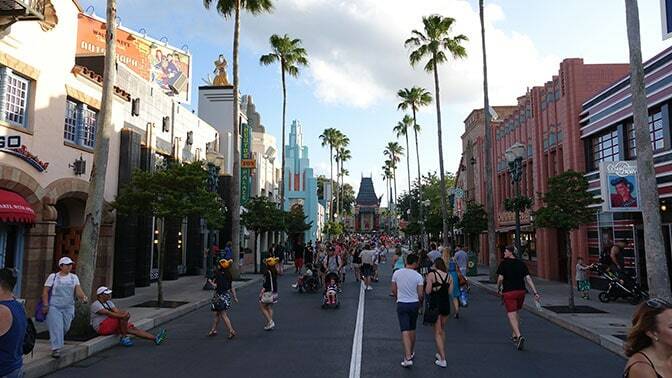 If you go too far left, much of your view will be blocked by trees and you won’t see much of what happens in the center of the Great Movie Ride. You can see the large scale fireworks, but miss a lot of the show. Conversely, if you go too far right, you won’t see the large fireworks and some of the projections on the right hand tan building. Each evening the Cast will tape off lines. You can be on the left of the left hand tape or the right of the right hand tape across from the dessert party. 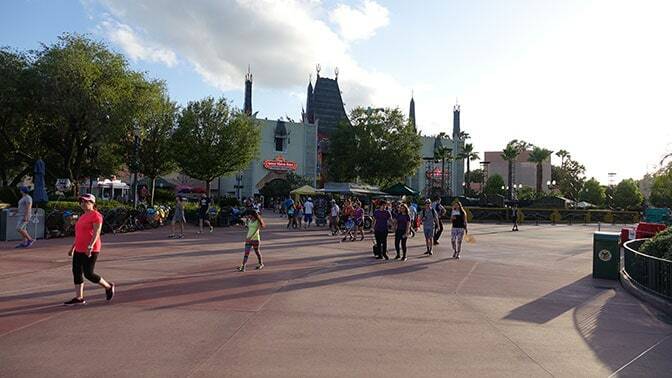 The tape to the right of the Dessert Party will likely be occupied 1.5 hours before the show. The entire prime viewing area is pretty congested by 45 minutes before the show with people stepping over sitting guests to find empty spaces. The Dessert Party cost me $69.00 (adult) and $39.00 (child) and you’re told it will begin 1 hour before the fireworks, but they usually allow entry at least 1 hour and 15 minutes early. 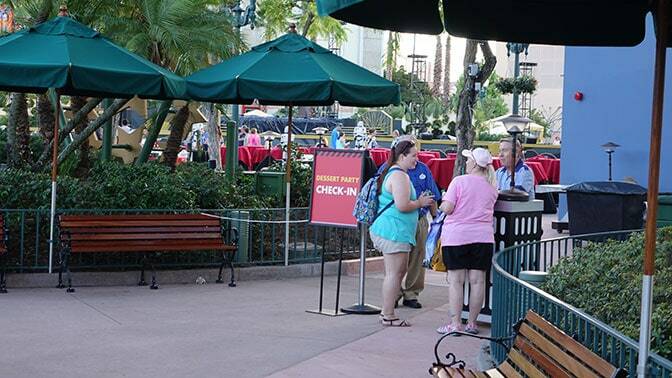 The check in area is on the back side of the red table area across from Min and Bill’s Dockside Diner. I highly recommend checking in at 8 to 8:15 pm. And wait near the benches on the left of the photo. 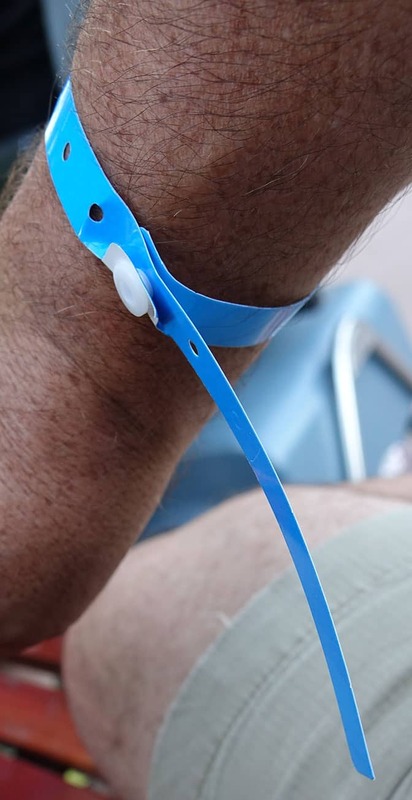 Your’e given a wristband with a pull off tab area. The pull off tab allows you to redeem for a complimentary Chewbacca drinking stein. It’s valued at $13.99 in the park. We were told we could pick them up as we were leaving, then were told to get them right before fireworks, then asked as we were leaving if we had them already. 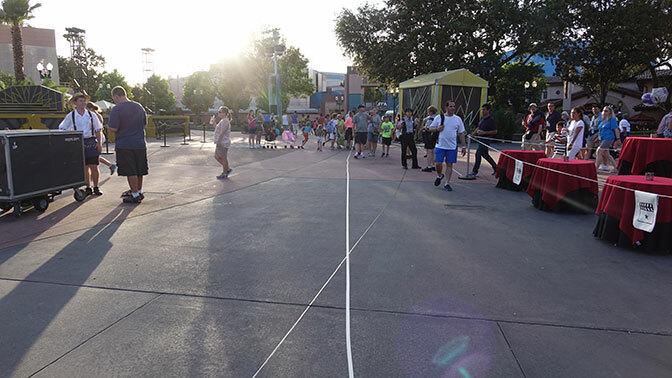 The front row is reserved for guests in wheelchairs and ECVs, but the Cast allowed other guests to fill the area along the rope after all handicap guests were ushered to a table. The absolute best view is along these 2 front rows, but any table has a good view. I was among the first in and placed my hat on my preferred table. The only downside to this experience is the lack of chairs. It would have been nice to at least have a folding chair of some sort to relax a bit and enjoy the show. Here’s my view. Human eyes are actually a wider view, but that’s all my camera would do. See those palms on the right of the photo? That’s the place that you’ll see the big booms! 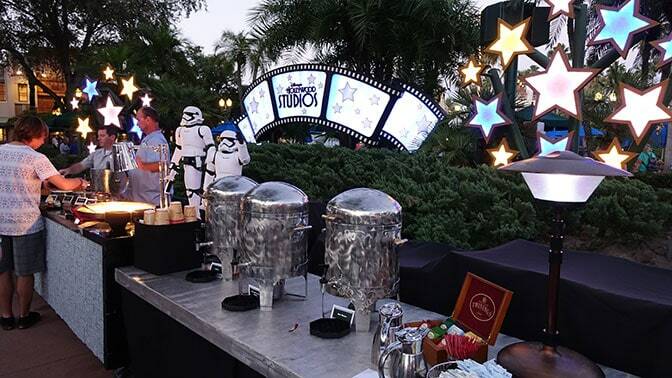 While we enjoyed some snacks and drinks, the First Order Stormtroopers mingled with guests. One guy had a horn on his ECV that amused them. They didn’t enter the Dessert Party area. You’ll see hot water, tea, coffee, water and soda. Drink as much as you want for just over an hour. It all closes when the fireworks begin. 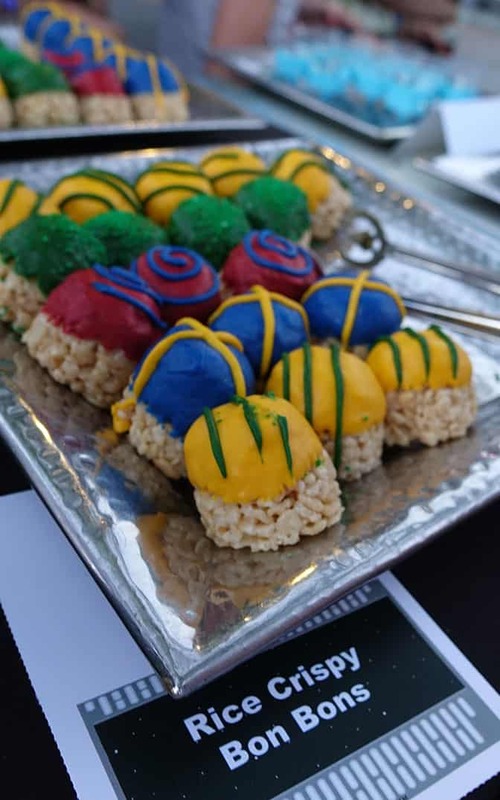 It’s a Dessert Party, so you’d expect Desserts, right? 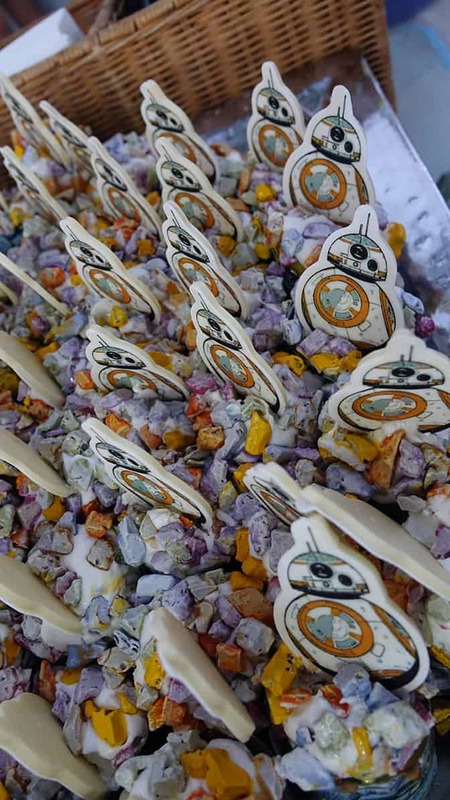 Here’s a mini version of the BB-8 cupcake that is sold in some counter service locations in the park. 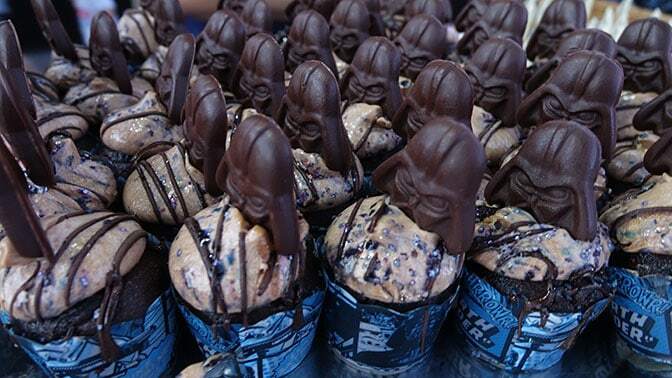 There’s also mini Vaders that are chocolate with peanut butter icing. Makes you just want to take all the mini Vaders home, huh? 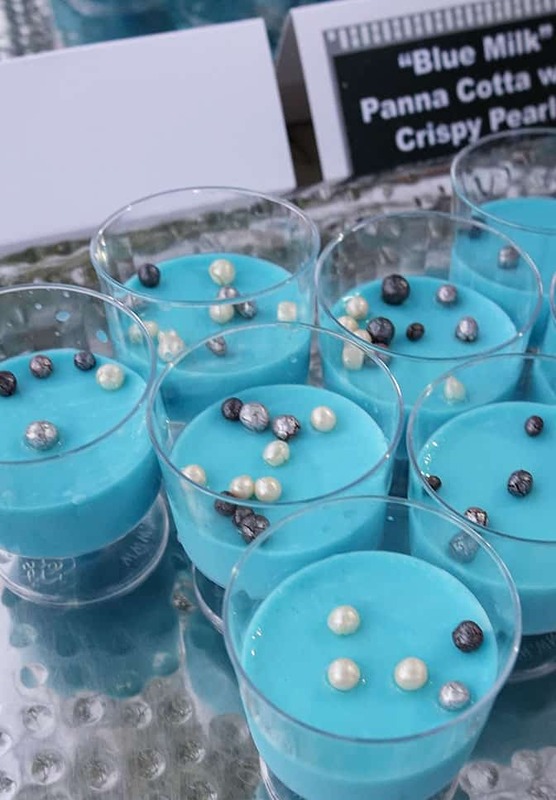 Blue Milk Panna Cotta was good, but pretty sweet. Basically just rice crispy treats with icing. Red ones leave an odd taste in your mouth though. 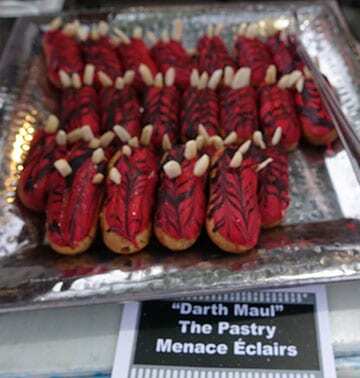 They offer a Nutella Mouse that is fast frozen and topped with Dark Chocolate and or Raspberry Sauce. The Raspberry sauce finishes the mouse nicely, I recommend adding a bit of each. 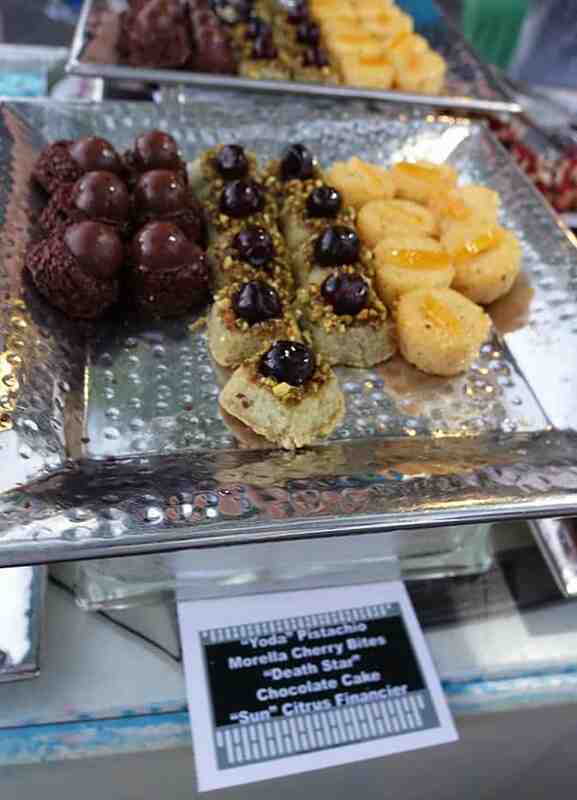 Each of the following punch products are tasty but they have a tang or sourness to them. You’ll likely find yourself needing a bit of water. 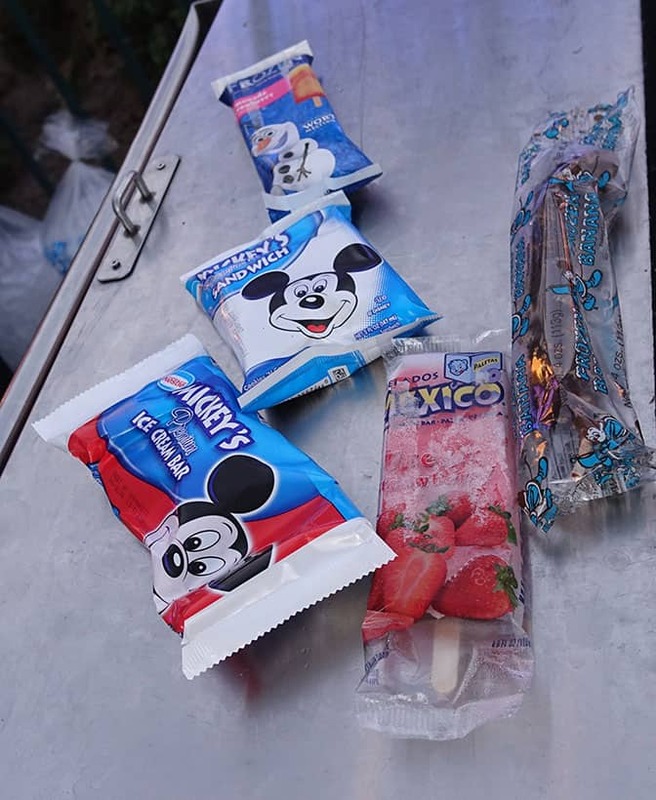 You’ll have unlimited access to all these traditional park frozen treats for entire hour. About this time you’re on sugar overload and your children are climbing on the tables. The large cookie dessert with ice cream was delicious. 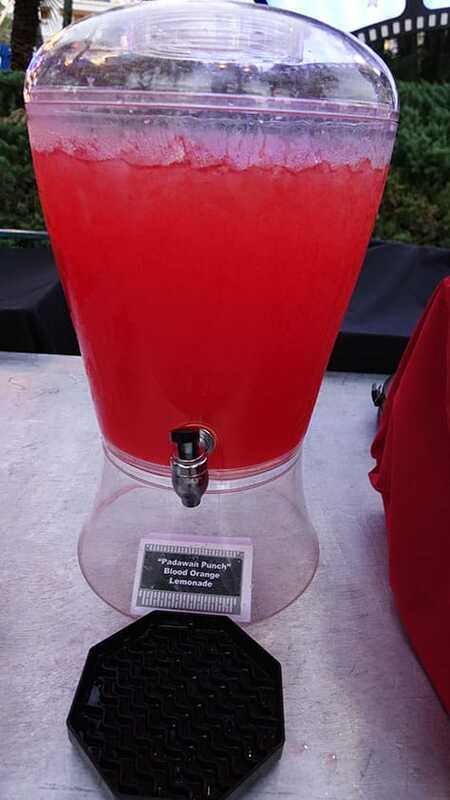 Those who imbibe on alcoholic beverages will find an unlimited flow of specialty drinks for an hour. 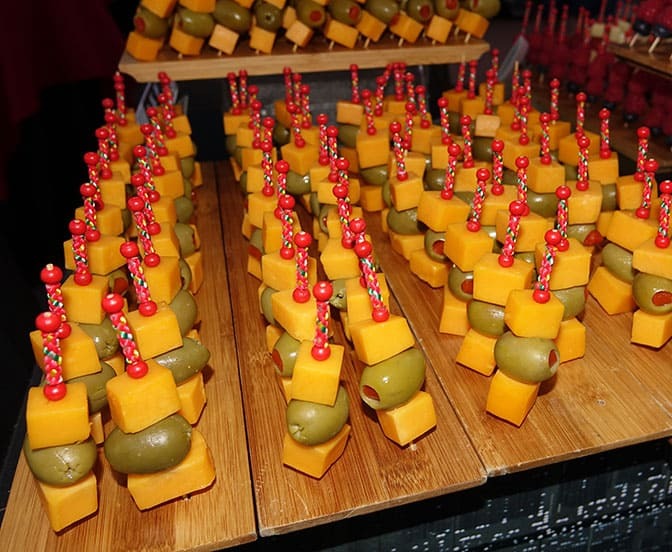 In addition to the sweets and drinks, there’s a few savory items, cheese and fruit on a separate table as well. 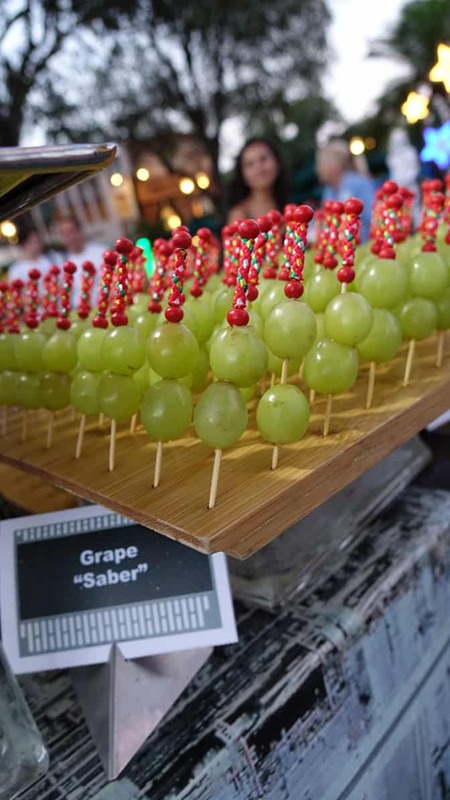 Your kids will likely have light saber battles with the toothpicks. As for the viewing area. It’s a highly recommended area in front of the Great Movie Ride with a full view of all the projections, lasers, fire cannons and pyro. Here’s my full YouTube video of the Fireworks, followed by several photos. Star Destroyer flies over Hollywood Studios. AT-AT Walkers on the rampage. Notice the fireworks on the right as I mentioned earlier in the post? I love how they included the laser blasts going back and forth between the Rebels and the various bad guys. On Friday, June 24, 2016 the designers were finally given permission to unleash the flame blasters and I was there to see it. I took this photo with my phone camera, but you can see the flames bursting 30 or 40 feet into the air. Great addition! 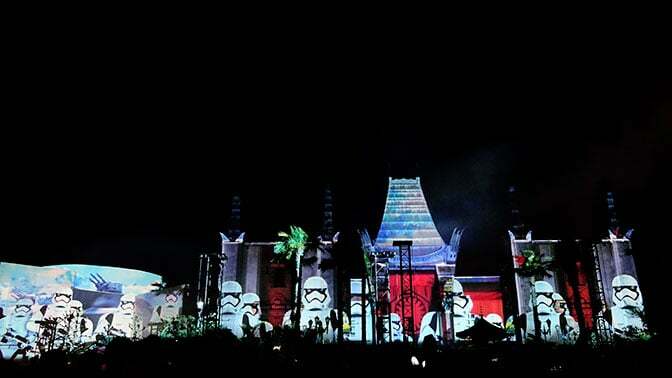 The First Order Storm Troopers look pretty cool on the buildings. See the projections extend to the left building and the right one is out of frame on my camera. 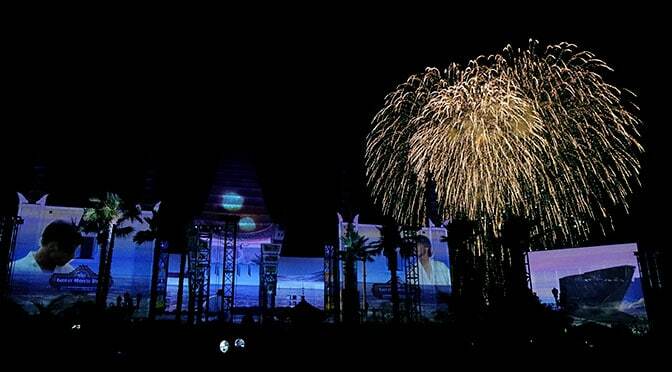 I love how the Palm fireworks fall over the New Hope scenes. 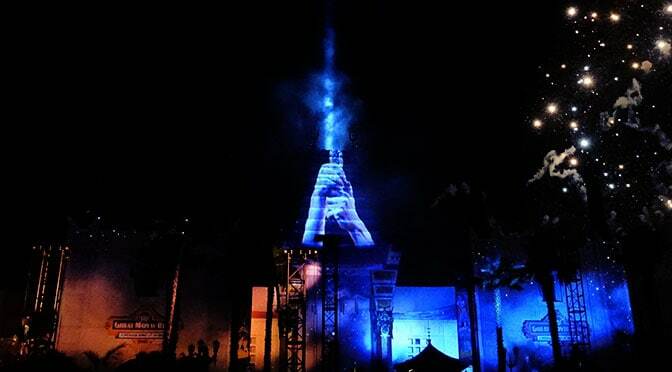 Everyone loves the final scene with the light saber rising from the Great Movie Ride. The Dessert Party with the Chewbacca stein was actually a very nice experience and I didn’t feel crowded with people trying to squeeze into every possible inch of ground. You can enjoy some desserts and drinks, meet some new people and watch the fireworks with no stress. If you have it in your budget to afford this experience, it may be worth your while to book it. 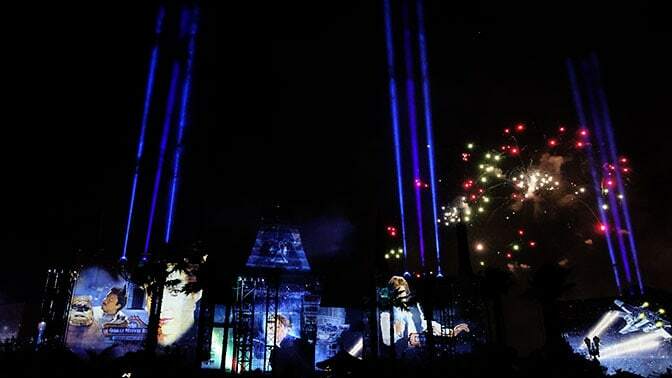 Some have asked me if they could watch Fantasmic and rush over to see this show. As my story and photos exhibit, you’ll find it pretty tough to get a full view of this show and the large fireworks will likely be out of view. 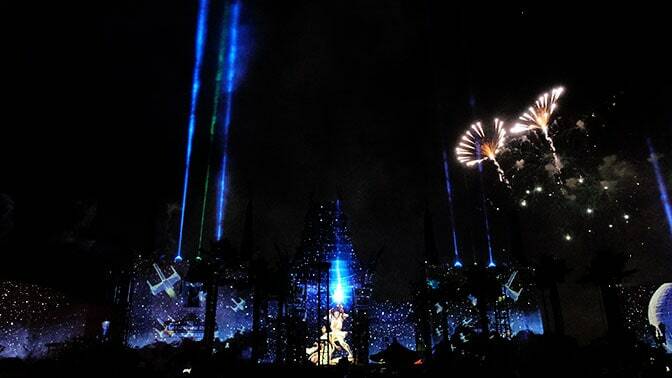 If there’s 2 Fantasmic showings, visit the 2nd. If there’s only one, I would choose the Fireworks or visit 2 different evenings. Do they still offer the ice cream (mickey bars, mickey sandwiches, etc)? 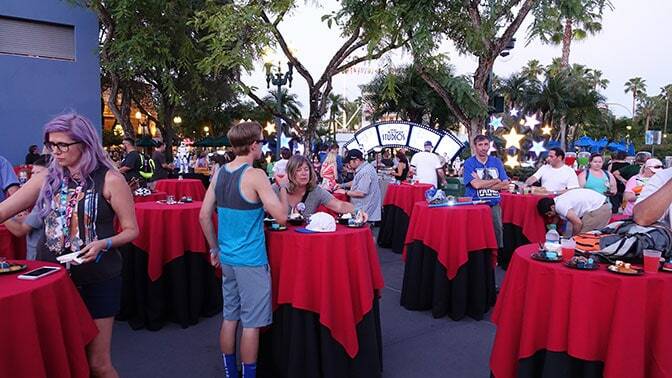 Hi Kenny- We are debating the guided tour (which includes the dessert party- in December. 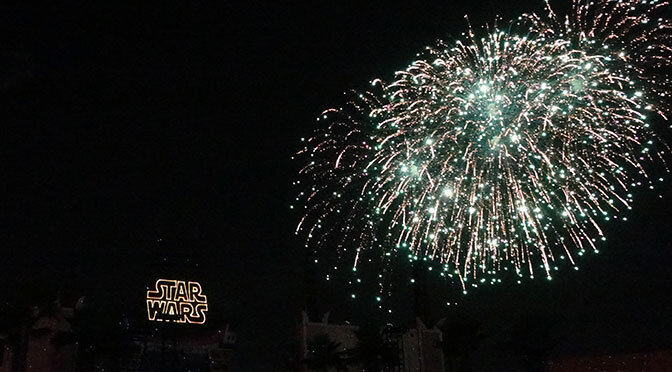 Obviously it is very early, but will there likely be the star wars fireworks during the Christmas season? I saw something about a Jingle Jam (or something along those lines) and am hoping it isn’t a substitute. 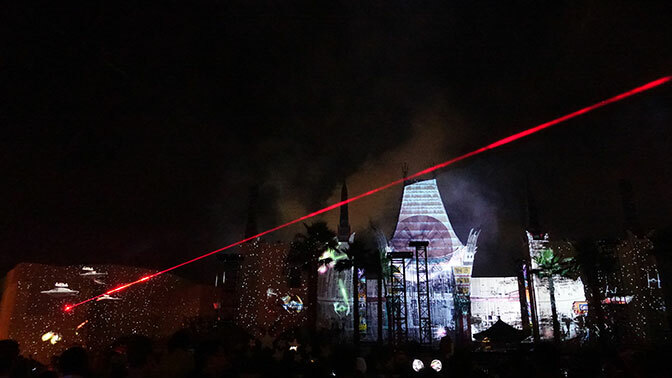 Question: Do you know what happens if you book the dessert party, and then it rains that night? Will Disney give you your money back? We were at the very first “bookable” SW Dessert party, and then experienced it again in September of 2016 after it was moved into the SW Launch Bay. 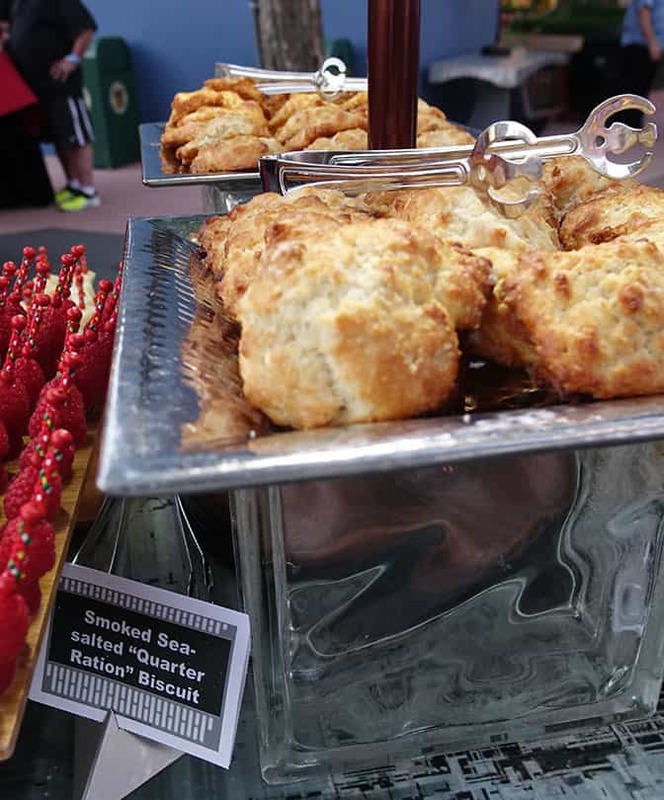 The Launch Bay version of the Dessert Party is very similar – most of the goodies are the same, as well as the drinks. 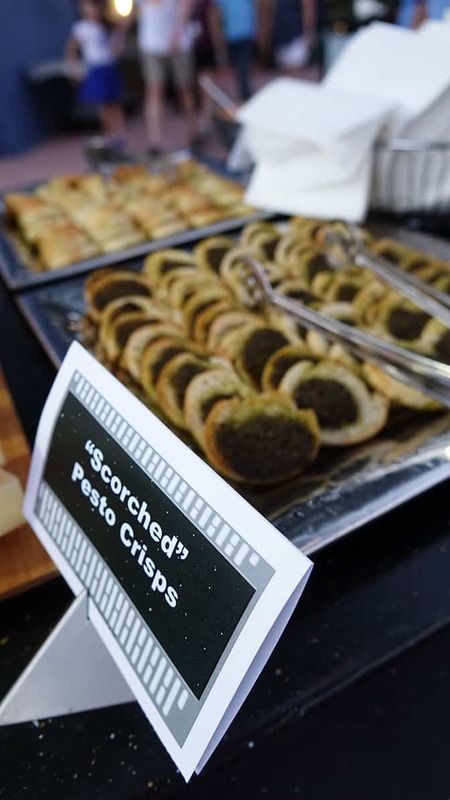 We noticed that they do have a Gluten-free selection available, and a CM will walk folks with food allergies or sensitivities down the lines to show them what’s safe for them to try. A bit more seating is available here, however, it’s first come, first serve and if you stand up to refill a drink or grab another snack, don’t expect it to be there when you come back! Chewy & Kylo Ren both had meet n greets going during the party the night we were there; the actual party area is roped off, and requires your wrist band to enter/exit the party area. You are free to come and go about the entire Launch Bay area during the party. We had tons of fun “playing” with the Jawas, and trading trinkets! 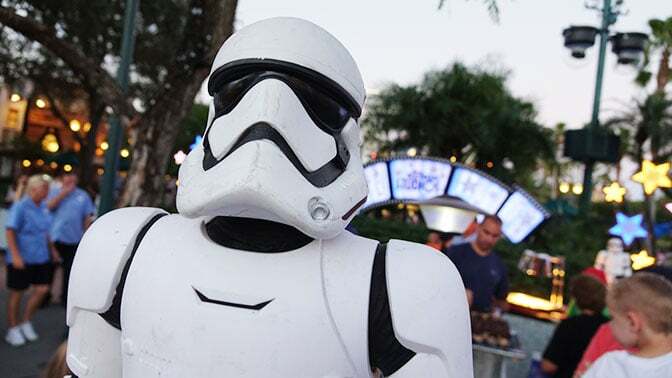 Storm Troopers regularly walked through the party, interacting (as much as they can/do) with guests. Pro tip: find out what time they will be going to out fireworks, and then make sure you are inside near the main party area – this gives you the best shot at a good spot for the fireworks. The new fireworks location for this party is on the RIGHT side (opposite side) of where it was previously roped off. So, you are just to the right of center of the Great Movie Ride/Grauman’s building. ECV/Wheelchair/Stroller as a wheelchair guests will be lined up along the front, just inside the rope line. Storm Troopers will “help” get everyone inside the roped off area. Overall, this is reasonably “wheels friendly”; the hard part for ECV/Wheelchair users is navigating the crowds that are around the food and drink as it can get very crowded. As at the previous outdoor party, you are given a Chewbacca mug as a souvenir. For the hard-core SW fan, this is a great experience. I’m glad we went both times. I waited for months for them to release the dates between Xmas and new year and when they released them they sold out immediately. Any suggestions? Hi Kenny, any reason why Disney haven’t released dates/times beyond 24th September? Don’t tell me it’s not going to be on in October. Hey KtP! 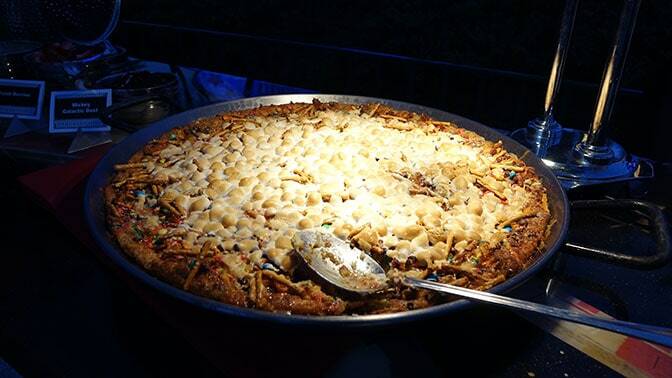 When do you think dates would open up for the dessert party in the fall? We are looking at early November. Thanks! 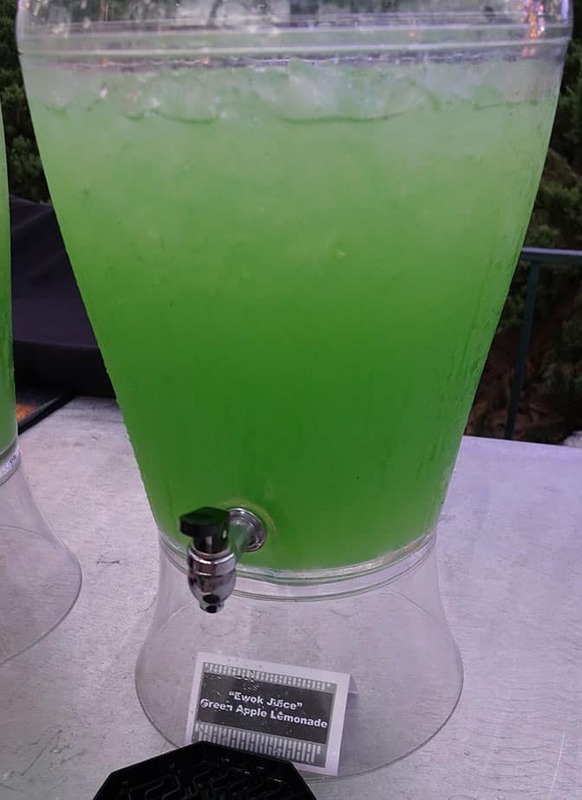 Just curious, are you able to fill your stein with a drink to go when walking out to see the fireworks? 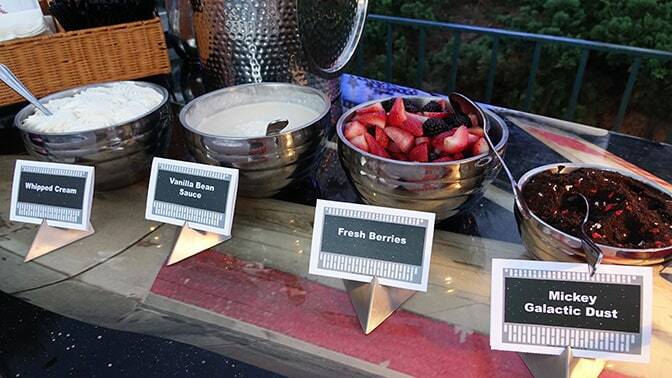 Did you happen to notice if there is wheelchair spaces if you don’t do the dessert party. Just wondering if the dessert party is the only way my son is going to get a decent view. I haven’t seen any reserved handicap spaces outside the fireworks area, but I’ll look into it more. 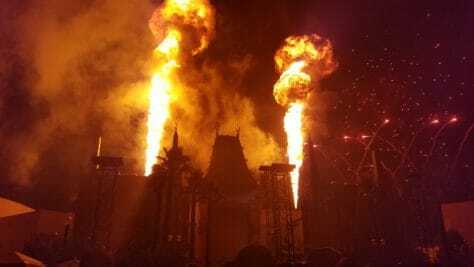 What happens if you book the dessert party and the fireworks are cancelled due to rain? You’ll still get the dessert portion and no refund is provided. Rain doesn’t usually cancel fireworks though. Please help!! I have already booked the Pirates & Pals cruise, but should I cancel that & do this instead?? We can only do one or the other.. I want to get the best value, there is 4 of us that include 2 teenagers, so which would be better? We have never done a dessert party so please give me your opinion, thank you! Great review. We are planning a trip in January 2017, will it still be available and when would be able to book it? ok so let me get this straight (great review and pics by the way). Every paying adult and child gets a Chewbacca stein included? free alcohol for the hour and great viewing area that’s not crowded? I’m pretty sold on this. Only thing is, you said it was moving? So the next area might not be as great? Thanks in advance. 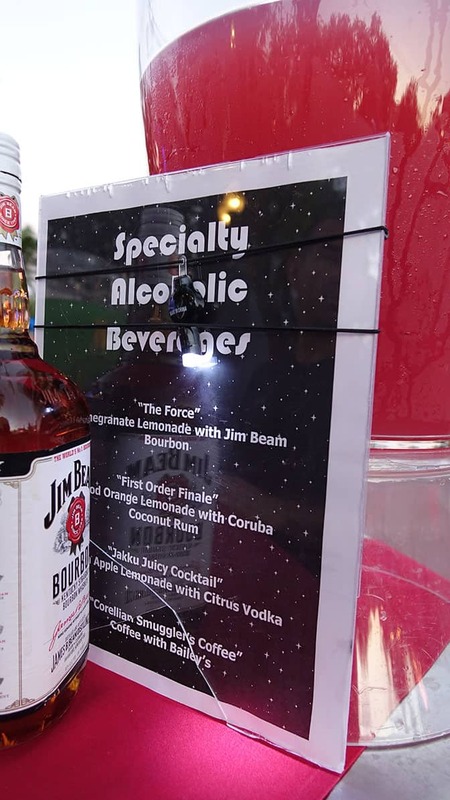 The hour with food & drink is moving indoors to the Launch Bay, which probably is a good thing (air conditioning). 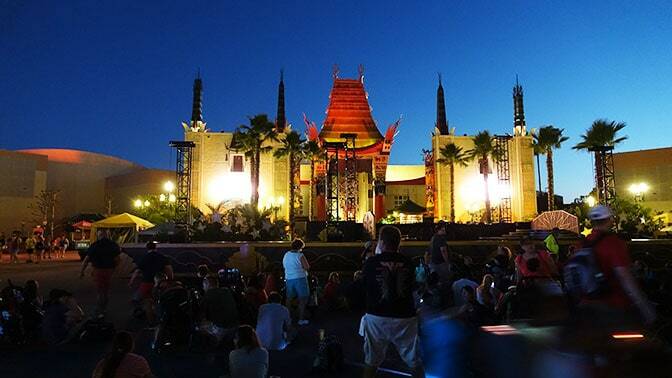 The guests will then be escorted out to watch the show 15 minutes before it starts. As long as the viewing location is the same (or similar), this is probably a positive. 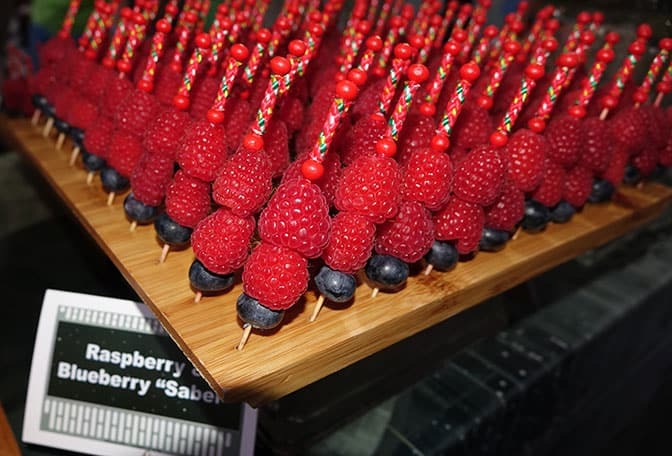 Although I’m sure some people enjoy having the food & beverage portion “inside the ropes”, as it allows other non-Dessert Party people to watch in envy. I’m not that type. Thank you. I’m not that type either, I would much rather the air conditioning. I was just concerned about the viewing area changing because this area looked great. and of course it stinks that you really can’t sit when you are eating. Or at least my son, lol. Just want all the info before I spend that kind of money. But the alcohol is a huge plus! Yes. I doubt they will downgrade the view. I’ll go tomorrow and confirm though. Would love to hear what you thought, Kenny–with the new location! About to the pull the trigger on the July 28th party! Thanks! Any seats in the new area? Is their any information regarding how long this will be offered? As an alcohol drinker, I may be able to justify the cost. I didn’t see beer or wine. 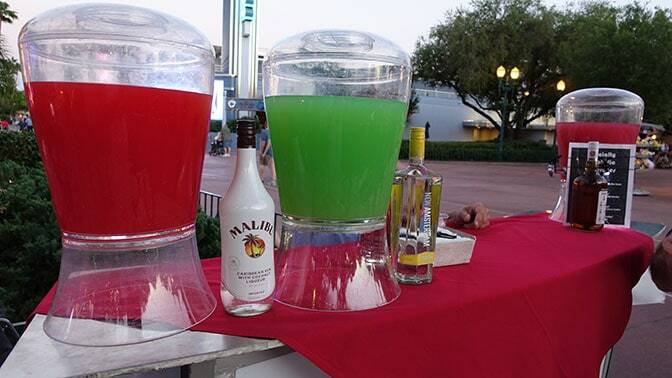 Is is just mixed drinks? Didn’t see, but can’t say they don’t. Could have been behind the bar. for this will be released? 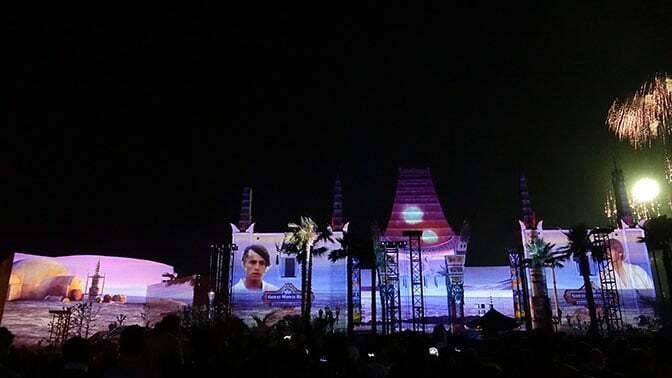 Are there any “bad seats” at the dessert party or would you say that generally if you attend the dessert party you will have a good view to the show? Thank you for the review! I have seen the old fireworks (and LOVED them). In your opinion, is one show better then the other? I like this better. More to see than just pyro. Much more engaging. 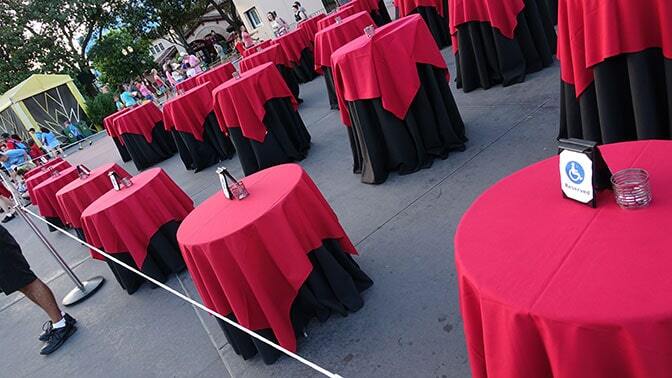 Would like to try the dessert party but probably won’t as long as they don’t have chairs or stools. We were able to sit at one of the picnic tables at Min and Bill’s about 20 feet from the dessert party. Shared a footlong and Mickey bar and had a fantastic view for much less cost! You were viewing the old fireworks, as I stated, that will no longer be a great view as much of the projections will be obstructed. We’ll be there early September. 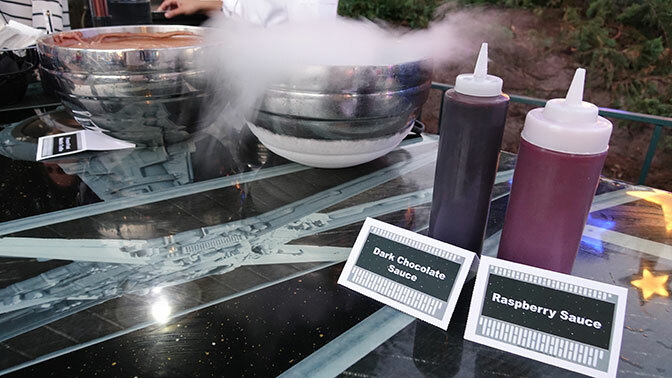 Any idea when Star Wars Dessert Party reservations will open for then? Wow, I can’t believe they don’t have chairs. I have two young kids, they would be walking all day at the park and now have to stand for almost 2 more hours? Do they let strollers in? Did you see anyone sitting on the floor? Hi Kenny, If Fantasmic is at 7pm, can we do the Fireworks Dessert Party right after? As the note at the end shows, it depends upon the timing of the shows. 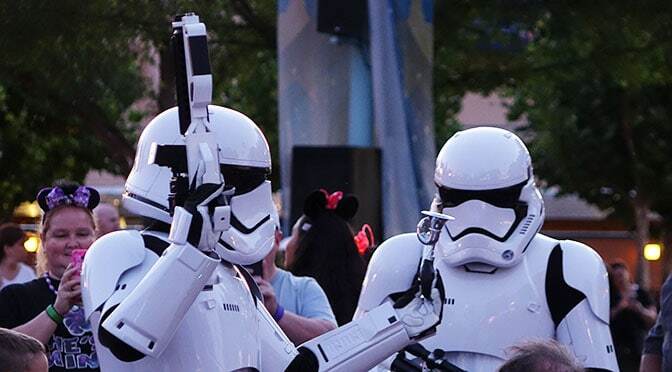 I haven’t found a good answer for this everywhere so I assume everything is still speculation but- my family will be at Disney mid December and my husband and son are Star Wars crazy, do you think they’ll still be offering this party? I’ll go with seems likely. 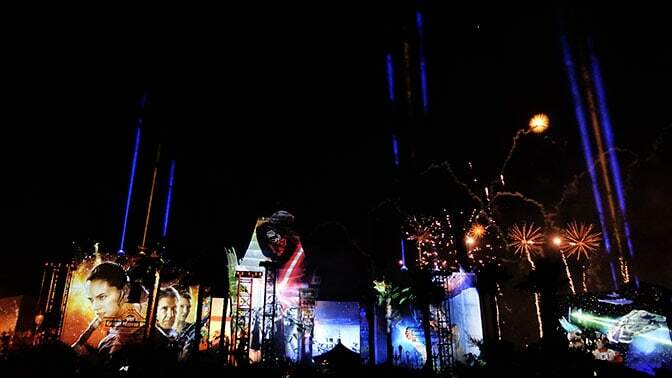 This show is really popular and I think the Dessert Party will become more popular as well. Hi Kenny, we are going in Jan 2017. Any idea what time the fireworks show will start then? We saw Fantasmic last year and are prepared to skip it, but I was thinking that if the fireworks are later, we could see both? Fireworks times for that far off aren’t provided yet. You’ll find that data on my Crowd Calendars when it’s provided. For the hour you’re there. Thanks for the review. I am actually looking forward to having the party indoors, but am curious to see where they will put us for the show.